The first week in my challenge to run a 100-mile training week before the end of 2011 was never going to be that tough. (If it had been I think that would have been a cause for concern…) So, 51.85 miles in five training days puts me comfortably on plan. An 8.5-mile after-work circuit of Regent’s Park (two laps, in the dark as it turns out since street lighting appears to be a luxury that part of town considers it can do without). 12.5 miles in total from a double-run day to and from work on Tuesday. A 9.3-mile after-work run along the Thames, passing through Battersea Park and heading back to the office via the Chelsea side of the river. Another 12.5-mile double-run to and from work on Friday. A 9-mile hilly session heading up to Highgate and then back with a couple of laps around Finsbury Park before heading home on Sunday. Because distance is such an important part of this challenge, I’ve been more conscientious in waiting for my Garmin to catch satellite reception before heading off for my runs. That’s fine at the weekend or any run heading from home, where the watch is quick to catch on. However, in central London, with many buildings around work being at least 8 floors high, it takes an age. So far I’ve been subjected to many strange looks from commuters wrapping themselves in winter coats against the autumn blasts of cool air as I stand at the edge of the pavement in shorts and t-shirt staring intently at my watch. I noticed on Friday, when I was getting ready for my morning run, that my left ankle was feeling a bit stiff. Unsure what it was, I took the first few miles of the run quite gingerly as I waited to my muscles to fully warm up. It felt a little like my heel might be bruised, with twinges of a stiff achilles. 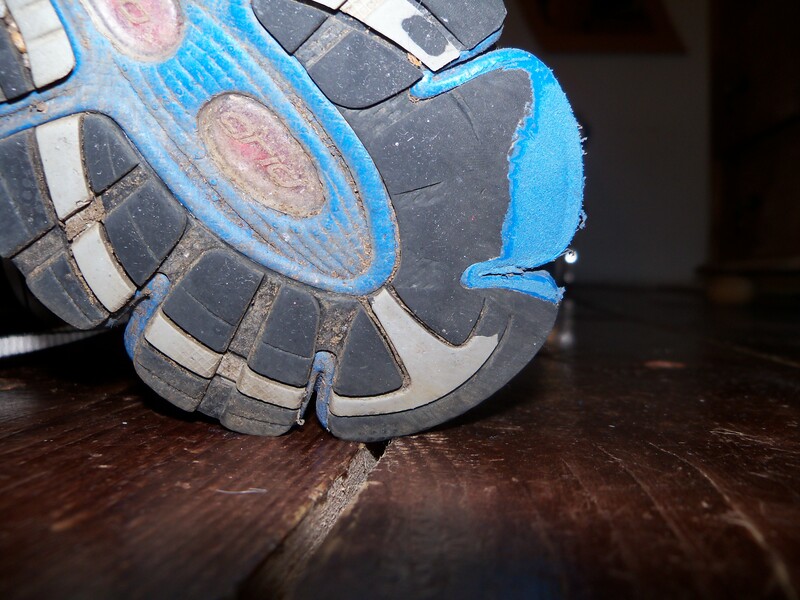 It was only Sunday morning when I thought to have a look at how my running shoes were faring. I bought these shoes in February 2011 for the 2011 Virgin London Marathon.